A poet, at his or her best, channels the rhythms of life and death. That was the last poem in John Edwin Cowen’s latest book, Poems from Dylan’s Wales, a reflection on Welsh poet Dylan Thomas’s life and death. Just months after its publication earlier this year, Cowen died on August 23 at age 71. There was no hint of this abrupt departure in Cowen’s vigorous poetry reading in June at his favorite hangout, Louie’s Charcoal Pit, in his hometown of Teaneck, NJ. Amid a crowd of admirers going back to his years as a local school teacher and administrator, and more recently as an education professor at Fairleigh Dickinson University, Cowen signed a copy of his new book for me—“A fellow poet who I met at the Louie’s reading—June 18, 2012”—in a firm scrawl. But in his homage to Dylan Thomas, the fabled poet from a tiny backwater of Great Britain who died at 39 in New York, Cowen channeled death’s realm. Earlier in his visit to Thomas’s hometown during the 2011 International Poetry Festival in Swansea, Cowen made light of tripping on the steep hillside at Laugharne Cemetery and falling on the famous poet’s grave. But the poem turns macabre. He was pleased with the way the trip to Wales turned out, how traipsing Dylan Thomas’s home grounds inspired a flurry of new poems. He was delighted that two poets he met at the festival recommended his work to Anaphora Literary Press, which later that year brought out Mathematics of Love, a collection of Cowen’s poems that had previously appeared in literary magazines. He was further delighted when Stanley H. Barkin, publisher of Cross-Cultural Communications, printed a handsome collection of Cowen’s poems inspired by Dylan Thomas. The book is co-published by The Seventh Quarry Press in Swansea, Wales. As he turned 71, Cowen had crowned a lifetime of scribbling poetry amid teaching and academic administration work with two books of his poems appearing in tandem. 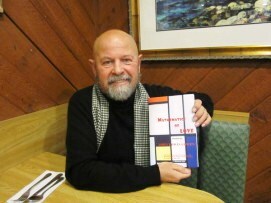 He celebrated each publication with a reading at Louie’s Charcoal Pit. By happenstance, my partner and I decided to eat at Louie’s one night and discovered Cowen intently reading to a rapt crowd. We returned for his next reading in the restaurant, as well. You never know about poets, where they’ll spring up.